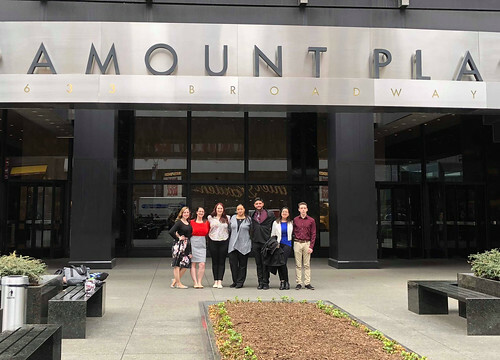 Sports, arts and entertainment management students and alumni spent spring break in New York City making career connections — meeting with industry leaders from Atlantic Records, Madison Square Garden, New York Mets and more. “My favorite part of the NYC trip was our meeting with Atlantic Records. Since the trip, I’ve already been in contact with people there and have received more information about their internship program,” said Samantha Exler, a junior SAEM major from Moon Area High School in Moon Township, Pa.
Additionally, the group attended a Point Park University alumni networking reception, took a tour of NBC studios, went to a New York Islanders hockey game and saw the Broadway show Come from Away. “You often can’t get these kind of contacts and connections on your own. I highly recommend going to this annual trip and taking full advantage of your time in NYC,” said SAEM 2017 graduate Brittany Bishop, social media coordinator for both the Pittsburgh Youth Symphony Orchestra and the Pennsylvania Interscholastic Hockey League. “Since I work part time for the Pittsburgh Penguins, it was very beneficial meeting with ticket representatives from the New York Islanders and drawing comparisons to what I do,” explained Jessica Martin, 2017 SAEM graduate and M.B.A. student.